We will have a welcome table at the homecoming BBQ, 5-7 p.m. Friday Sept. 28, to help people find each other, as well as all day Saturday. Add your message on the form below. Teachers and staff are welcome to add messages, too. You can see old class photos in our Archives. Mervin Brandt – Attended connaught 1952 until 1961. Don Young and I formed a dance band and played for our grade 8 graduation. Stan Shaw was school principal. Nichoson vise principal. Mrs. Read grade 6 teacher. “Slim” was the janitor, I can still see him spreading “dustbane” on the floor in the halls then pushing a 4 ft mop up and down the halls. Our class sang God Save the Queen every morning, standing up and looking at the Union Jack flag, front of the class room. God, I sure don’t feel that old. 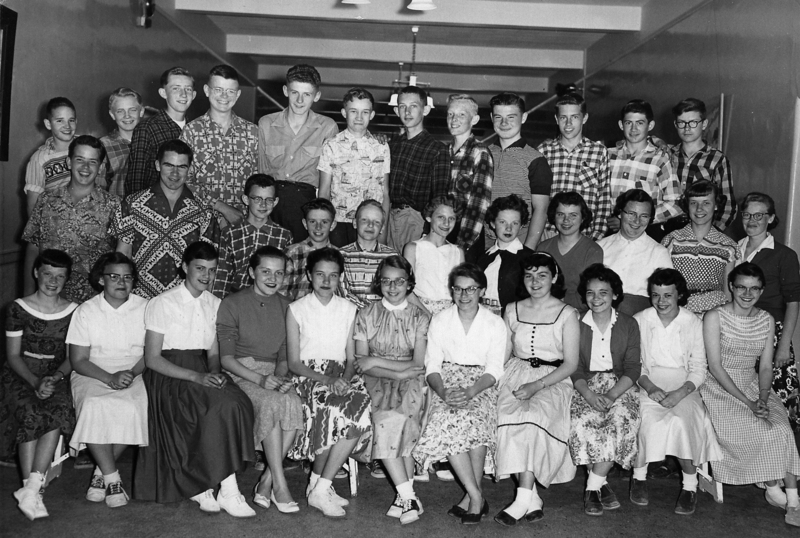 Looking forward to Sept.
Gary Little – I attended Connaught from about 1946 to 1953. Brenda Fleming – I attended Connaught from kindergarten to grade 8. I was SRC president (1984?). My daughter is in grade 8 at Connaght this year. Amanda Snell – Connaught School has been a school that has been part of my family for genereations. My daughter/step-son were the 3rd…possibly 4th generation to attend Connaught. My step-son still attends, in grade 3. I graduated grade 8….after attending connaught since grade 3. I have always recommended Connaught, and will continue to do so. Even though I live in the North End, I will take the extra drive every morning and afterschool to drive any child in my home to attend Connaught, over any other school. Donna Zbytnuik (Alspach) – I went to Connaught from 1949 to 1957. At that time you had to be 5 by the end of June to enroll in kindergarten, my birthday was July 9, so I missed out. I went right into Grade 1 the next year. Because we lived within 2 blocks, our activites centered around the school, even in the evenings, playing softball or any game we could round up enough people to play. Also had baseball games with students from visiting schools, which set up some rivalries. Also as a youngster in grade 1 or 2, I remember having to stay in at recess to drink a half pint of milk, apparently someone thought I looked under nourished. Sometimes someone else would drink it for me, as I wasn’t fond of milk. Don Young – I attended Connaught for grades 6 to 8 1958 to 1960. I formed many lasting friendships there and look forward to renewing some old ones. I also started playing in my first band the “Ebonnies” with Merv Brandt,Scott Peaker and Jim Darjes. Gary Robertson – I started at Connaught in 1947 until 1953, finishing off at Davin School. But our shop classes were back at Connaught in Grade 7 and 8. And then most of the students went to Central Collegiate, so I reconnected with many former class mates in Grade 9. A few years later, I taught at Connaught for about a month as a “Principal’s Assistant”, before moving on to another school situation. Orla Cuddington – I went to Connaught School for Grade 7 and 8 in 1969 and 1970. Duncan Blackman – Attended grades K (56-57, Mrs. Kitney), 1 (57-58, Mrs. McNichol), 2 (58-59, Miss Massie), 4 (60-61, Mrs. Beveridge), 5 (61-62, Mrs. Walshaw), 6 (62-63, Mrs. Read), 7 (63-64, Mr. Nicol), and 8 (64-65, Mr. Shaw who also was the Principal). (Note: For the Grade 3 term, my family went to Michigan for Dad’s sabbatical where I attended New Hudson school.) I have varying memories of my years at Connaught. In Grade K, Mrs. Kitney recognized my ability to read – Mom had taught me at age 4 – and gave me the opportunity to play the piano for the others. I was very shy and have little recollection of Grades 1 and 2, but the most consistent comment was that my printing was poor. A heart defect prevented me from participating in most student sports activities. My average marks were usually a B although this slipped in Grade 6 to a C largely due to a missed oral report and sloppy writing. Mrs. Read stretched our talents in Grade 6 by having us do oral reports. This requirement was almost my undoing when I copied another student and skipped doing a report resulting in a F with the result that my parents ensured that I had the next oral book report fully practiced and memorized prior to its presentation in class. This whole experience was quite embarrassing but helped me move out of the extreme shyness which had bound me. I remember Grades 7 and 8 being years where we were challenged to engage in critical thinking and given opportunity to debate the Grade 7 teacher. Of course the tumultuous world event’s (e.g., President Kennedy’s assassination) also had a profound impact on our education. Connaught school presented opportunities for friendships to be developed, for the furtherance of academic skills, for challenges on the playground (e.g., being picked last in scrub baseball games, kidding about my weight, silly attempts to be a defensive player in soccer), and for being recognized for one’s talents (I began playing the cello in Grade 4 and was accepted into the Inter-Collegiate Orchestra in Grade 5). Other incidental memories include the addition of the gym around Grade 4; the separation of the girls from the boys for recess but this wasn’t enforced for before or after school times; the somewhat larger field for the boy’s sport activities; the division of the playground into grade levels; having to remove boots on entering the school in the winter and line up to return to class; the lost and found box in the basement through which I often had to search for my brother’s mitts; the large ‘communal’ washrooms in the basement with stall doors which didn’t lock; the strap used often by the principal even in Grade 8 (the fear of being strapped kept my behaviour in check but didn’t seem to change the ones who had this experience); snowball fights; playing marbles for keeps (usually due to lack of supply I was an observer); snow days where school was cancelled due to storms; daredevils climbing the sides of the school to the first floor window ledges; school bells and fire drills; square dancing; grade 8 dances and trying to do the twist; and being restricted from reading ahead in one’s grade reader, but doing it anyway because the stories were so interesting. Dell Grossman – I went to Connaught School from Kindergarten to Grade 8, graduating in 1964. I remember being chosen to hold (support) a tree while it was being planted at the front of the school. I don’t remember why I was chosen but I do remember being very proud! Dianne Palmer – I Graduated from Connaught in 1969. 2 of my kids went to Connaught as well. John Wilson – My two older sisters, my older brother and I all went to Connaught. Joyce Gail Beesley (Harle) – I was a student at Connaught from 1946 to 10 1954. My brother was there from 1942 on, and my sister from 1951 on. My Dad and uncle attended there when it first opened. My maiden name was Harle. My husband also attended Connaught, his name is Bob Beesley. Hope Stouse – I attended Connaught from Kindergarten to Grade8. This was 1948-1956. Beryl Tell – My sister and I attended Connaught for our whole elementary schooling. Jenet Revert – Hello! A group of former teachers will attend the Friday event. We all taught at Connaught during our careers. We are Deb Froh, Lynda Patterson, Melanie Little, Jeanne Beauregard, Margo Campbell, Elaine Taylor and Jeannette Revet.